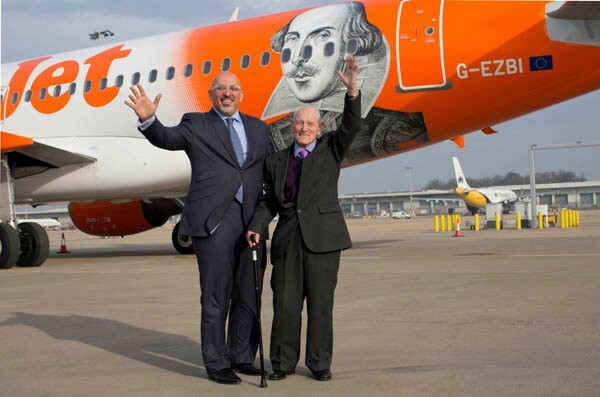 Low cost carrier easyjet has announced it is supporting a bid to make April 23rd William Shakespeare day after a campaign was launched by Britain’s oldest real-life William Shakespeare. Sharing the same name as the famous bard the 91-year-old Bristolian has seen high-profile backing for his bid with easyJet, Nadhim Zahawi MP and actress Emma Thompson putting their weight behind the campaign. In order for the debate be taken to parliament 100,000 signatures need to be gathered at www.easyJet.com/ShakespeareDay, and a special Shakespeare easyJet plane was also unveiled at London Gatwick, #Shakesonaplane, in order to get the bid off to a flying start. William Shakespeare from Bristol, said: "It is such an honour to be chosen to launch this campaign to recognise my namesake. All my life I have been proud to share my name with such an iconic British figure and I think it is important we recognise his achievements with an official day in the calendar." Paul Moore, Communications Director for easyJet added:‎"William Shakespeare is Britain's most famous author so easyJet is proud to back the bid to make 23 April his national day. "Our campaign will run during April in our in-flight magazine read by 5 million passengers a month, across thousands of seat back adverts and we will be staging free Shakespearean performances at airports across the UK. Passengers can win free flights by writing a sonnet supporting the campaign and it will be launched with our special Airbus which will carry Shakespeare's image on the side. Aviation and Shakespearean language combine for the name – Romeo Alpha Juliet." To ensure that your holiday is as enjoyable as one of the above performances it is important to organise travel insurance in advance.